W. Frank Thompson - W. FRANK THOMPSON "I am an artist who is not shy about using color or a lot of paint to make my point." "I am an artist who is not shy about using color or a lot of paint to make my point." Frank Thompson studied painting and art in Mississippi under artists Eloise McLellan, Randy Shoults and Bryce Speed. He holds a degree in Graphic Communication from the University of Southern Mississippi. 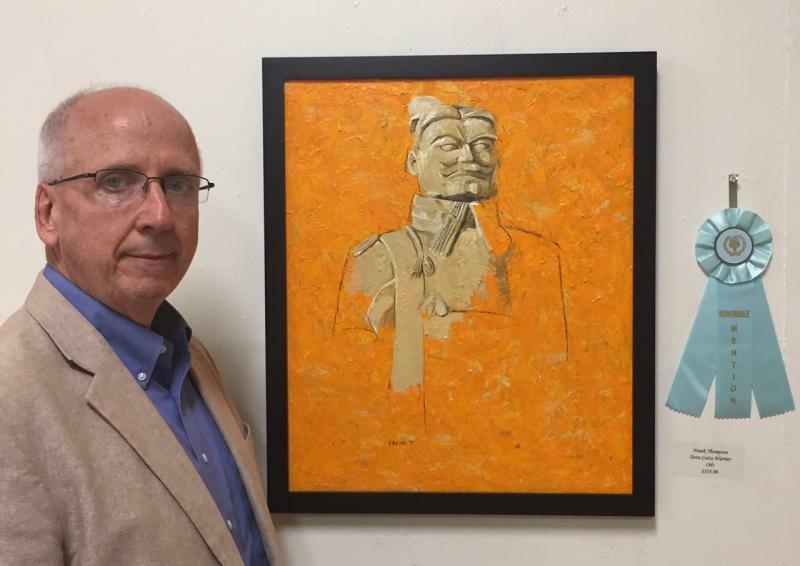 Frank has been the featured artist in solo shows with Eastern Shore Art Center, Fairhope, AL; K. Fulton Art & Frame, Meridian, MS; Rudd Art Center, Ozark, AL; and Beehive Coffee & Books, Monroeville, AL. He has also participated in several shows in Mississippi and Alabama. Frank resides in Troy, Alabama. The cows are joined by the animal works of daughter Sarah, a recent Troy University art graduate. This is the first two generational show to be held at the Rudd Art Center. The cows hit the road for a one-man show at the Eastern Shore Art Center in Fairhope. Frank's portrait of his father "Pop" was included in the alumni show "100 Artists" at the University of Southern Mississippi held in late 2010. Artist Frank Thompson and "Pop" at 100 Alumni in Hattiesburg, MS.